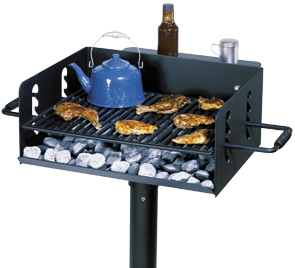 Belson is the patented inventor of the CHAR-WOOD® campstove park grill seen in thousands of parks from coast to coast. Its efficient design and rugged construction will ensure many years of dependable service. 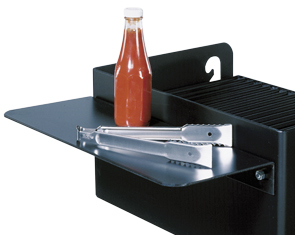 The grill grate adjusts to four different heights. 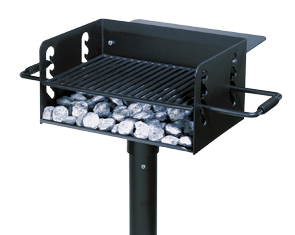 The CHAR-WOOD® is designed to burn either charcoal or wood and is available in two overall sizes: FC-1193 (15" x 20") or FC-1193-B (18" x 24"). A self-contained locking device prevents theft. Swivel mechanism allows 360° rotation for best wind draft control. The FC-1193-HC and FC-1193-BHC adapt the standard CHAR-WOOD® grills for wheelchair accessibility. Pedestal: 3-1/2" O.D. steel tubing, 40"Long with special vandal-resistant locking nut and bolt. Pedestal is to be mounted in a concrete base.